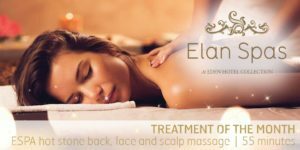 A tailored massage with hot stones unravels muscular tightness and discomfort in the back followed by a deeply relaxing face and scalp massage. Pure aromatic essential oils encompass the mind to relieve stress, recharge spirits and leave you feeling rejuvenated. Fri to Sun – normally £139.00 offer price £114.00 Sound good? To take advantage of this spa offer, contact us to book today or call 01647 445007. Offer valid until 31/12/2018. Subject to availability.